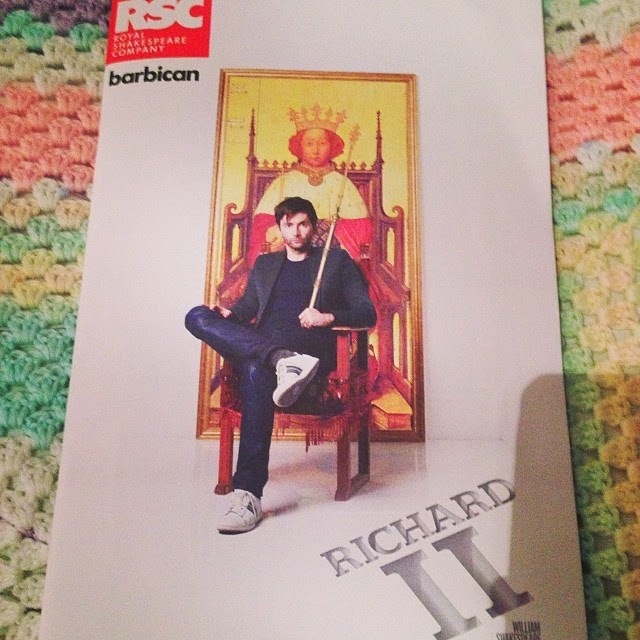 So, on Saturday 18th January 2014 I went to see Richard II starring David Tennant, in London with my best friend. Now I was going to vlog but trying to get to the Barbican theatre where the play was held was very stressful & I thought that, it wouldn't make for a very good vlog on my YouTube channel because I was walking around London with my best friend looking for the theatre for two and a half hours, I kid you not! Anyway rather than rant on about how stressful the journey of trying to find the theatre was. I'm hear to talk about the actual play and what I thought of it, now I knew I wanted to see the play pretty much as soon as I heard that David Tennant was going to be in it. I'd never seen him in an actual live theatre production, I've wanted to for a while so I was very grateful when I was able to get tickets. After I got the tickets and while I was sitting in the theatre, waiting for the play to start I actually forgot it was a William Shakespeare play oops. However I wasn't sure that my best friend would understand because Shakespeare's language is quite hard to understand but the good news was that she did. I think another reason why it was understandable was because the play was actually funny which I never thought it would be but it was, which was great. Now the play was just amazing, the acting was incredible and David Tennant was just phenomenal and he looked so different from any other acting role I'd seen him in, he had hair extensions in, black eye-liner and gold nail varnish on. Overall all of the acting was amazing and I had no idea that a horrible thing happened to David Tennant's character Richard and who did it, I don't want to spoil the play by telling you what it's about. I was very lucky and grateful for seeing the play, I enjoyed it and I didn't find the stage door afterwards because I didn't look as my friend and I thought we were lucky to find the theatre let alone trying to find the stage door as well. Now the play was quite long but it did have an interval and after the play my best friend and I made the journey home from London. The Barbican theatre itself is amazing It's so big because it has everything you can think of in one building, if you've ever been to it then you know what I mean. The theatre room was a very clear view and it was great to go somewhere new, I would happily go there again now I know where it is in London, I would also happily see David Tennant in another play, this play and his performance of his character makes me excited to read the play. If you've seen the play Richard II with David Tennant what did you think of it?